Chimineas (Chi-men-ea) were first created in Mexico and are a freestanding front-loading fireplace with a bulbous body and a vertical chimney. The cleverly designed bowl and flume allow for maximum heat to be radiated around the garden, whilst keeping the smoke controlled and blowing directly upwards. 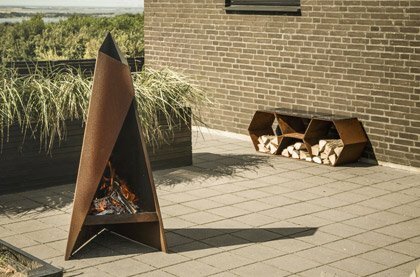 Chimineas were traditionally built from fired clay which was readily available, these days chimineas have evolved to include modern designs made from steel and cast iron. The perfect marriage of form and function, elegantly beautiful, chimeneas contain the fire and radiate the warmth of only a few logs to great effect. Chimenea (Chi-men-ea) n. Originally from Mexican Spanish, a freestanding front-loading fireplace or oven with a bulbous body and a vertical smoke vent or chimney. The history of the chimenea is evident in its quaint and simple form; a freestanding fire vessel, a bulbous body with a large opening and a vertical vent: so elegant and simple a design that it has largely gone unchanged for many hundreds of years (if it isn't broken, why fix it?). Traditionally chimeneas were made from fired clay, owing to its abundance in Spain and Mexico and the heat tolerance it provides. More recently, however, many cast iron and steel models have come to market, providing a contemporary twist on a timeless classic. Cooking chimeneas can be clay, traditional or modern in design, but what they all have in common is a grill or semi grill that inserts into the main fire chamber through the open front, allowing you to cook straight over the open flame. What better way to connect with our ancient origins than cooking with fire here and now, to gain first-hand experience of the raw and simple utility of the flame. 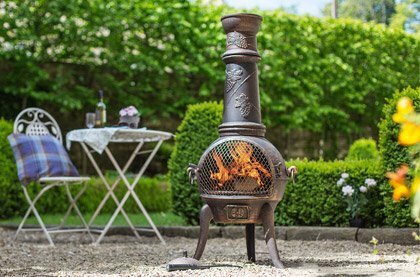 Our selection of clay chimeneas are perfect if you are looking to bring the warm cosy atmosphere that a working indoor fireplace gives you, out to your garden. If the selection is too broad for your needs, try using our filters to narrow your search criteria at the side of this page, so you can find the chimenea that’s right for you.